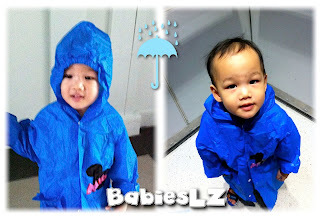 It was a rainy day, little one was happy to put on his raincoat. He was thrilled to have Mickey on his back when he's walking. It has been a busy period for us... A few more days before CNY and we were still doing last mins shopping and cleaning up. BUT I am happy! NOT that I like the cleaning or the last mins shopping. ✿ Love to see our family put in effort together to clean up the house. ✿ Love it when we have a break/meal after a whole day of shopping. 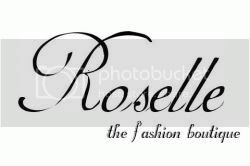 ✿ Love it when one of us try on new clothes and the rest of us gather around and give opinion. Even my little one would say "美美!" 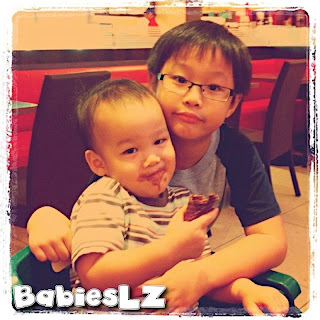 ✿ Love it when the brothers played together while waiting for 姐姐. And want to buy similar clothes. ✿ Love it when LZdaddy offered to carry all the shopping bags and shower for little one at the end of the day. I was extremely tired.... Once, I almost dozed off while having our meal when we were out (due to medication). When I think of what we have done together or 'achieved', it put a smile on face and it perks me up. 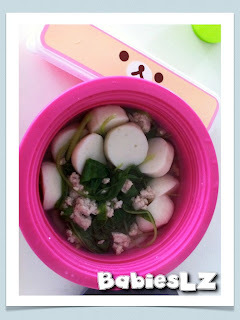 In the container: Udon soup with minced meat, fishball & spinach. Fruit not in picture. Usually if I post soupy lunch packed for my kiddos, means it's a rainy day. We love to have hot soupy food when it rains. I bought this transparent box yesterday and can't wait to place my stuffs in there. These are some of the stuffs that I have, intend to buy more of the boxes to sort these out. 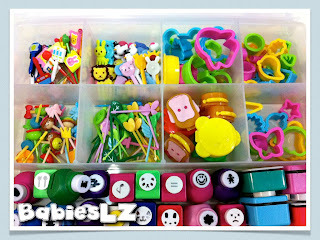 I have those bigger transparent containers for others like, bread cutters etc... Even though it's all the same old stuffs, it feels like I have new 'toy' to play with. 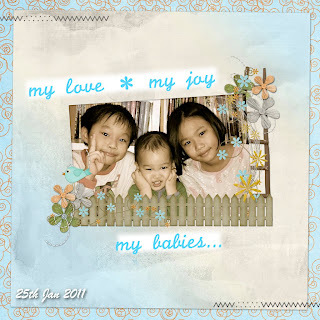 Taken just before bedtime.... ♥♥♥ them soooooo much! That's the smile I get nowadays. 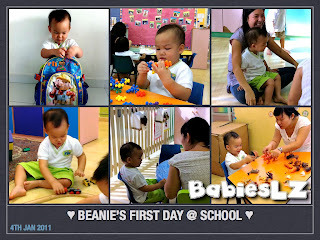 On the 13th Jan, after more than a week of attending school, Beanie finally walked into the classroom with his teacher willingly, no resistance at all. What made me so happy was that he waved bye bye & kissed me AND no crying at all! Yippee! This month, is not too good for us, everyone except Z, are taking turns to fall sick with high fever.. First it was Beanie, LZdaddy, me then now L is having high fever. ♥ (17 Jan) His 2nd word with 2 syllabus - MONEY! ♥ He likes to pout his lips lately. Sadly, I couldn't get a shot of him doing that. ♥ We caught him him once eating ice cream quietly outside my bedroom when the rest of us were inside. He opened the fridge, took the ice cream (our fav: Magnum) and tore the wrapper all by himself! I was too busied cleaning him up that I forgot to take a pic of him! 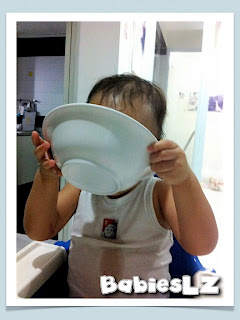 ♥ He loves to drink soup just like his siblings. ♥ (9th Jan) Beanie 'sang' a song to me for the first time! Even though I'm not so sure what it was, it was the sweetest song. Think it sounded like "twinkle twinkle little star"
♥ By now, he is able to recognize some of the colour: green, blue, red, yellow (ellow), white and pronounce most of it correctly. Green was the FIRST color that he recognized. Whenever I let him choose which colour t shirt he wants to wear or the bowl, he will go for the green. Looks like green is his favourite colour for now. 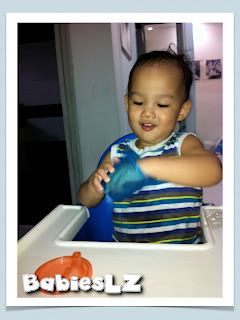 ♥ He likes to 'help' me with the washing of cups & plates (plastic ones). 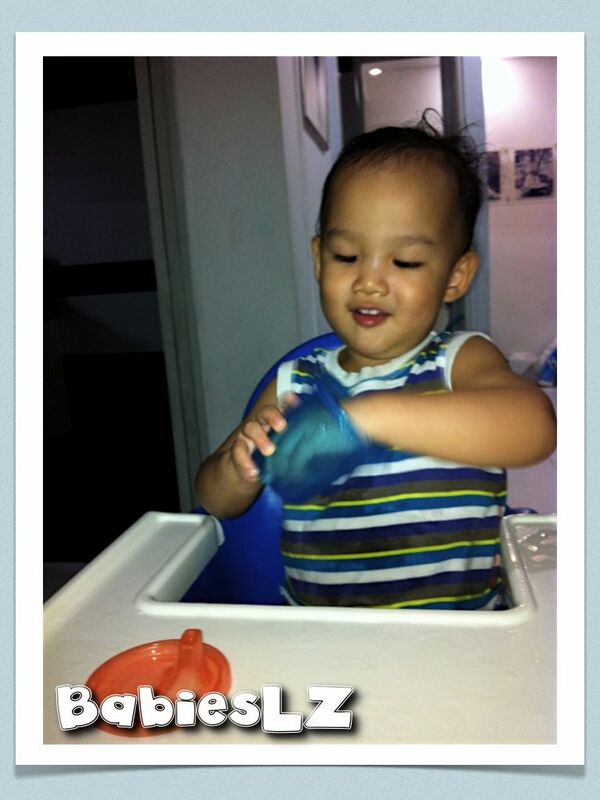 To the extend that, he pours out water from his sipper cup and 'wash' it! In the boxes: French beans with sesame seed dressing, stir fry pork with onion, rice & strawberries. Does it look like Elmo? Maybe a teeny weeny bit? This is the first bento for this year. 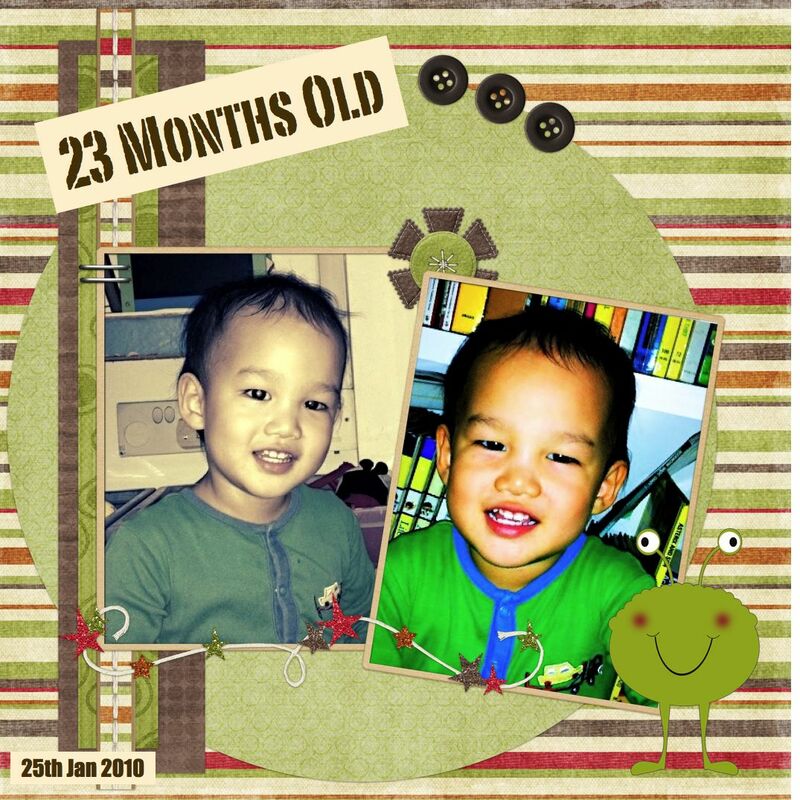 Time passes so fast... 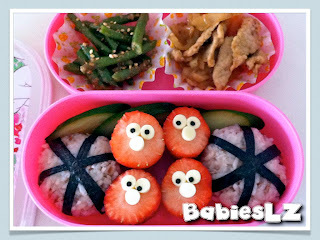 This is the 3rd year that I'm preparing bento for my kids. Not sure how many more years I will be packing, perhaps I will only stop when my kids tell me to. His FIRST Artwork From School! Yay! Little one brought home his FIRST artwork from school! 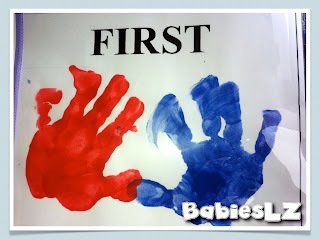 Look at little hand prints, so cute isn't it? Every Friday, Beanie will bring home his file bag, it contains what he does for the whole week. This week is the first week! We went through the file together and he was excited when he saw what he did. This give me the opportunity to encourage him to learn to tell me what he did in school. He may not be able to tell me much now but given more time, I hope my little Beanie will be able to do that. We have finally decided to send Beanie to half day childcare after much thought. We do not have a helper so I have to do everything on my own unless LZdaddy is in town to help me out. With him in school for that few hours, I will be able to get some chores done, cook lunch for my 2 older babies and if possible, some ME time. I'm sure he will enjoy, meeting new friends and learning too. Clockwise: Checking out what I put in his school bag, playing with toys, music time, playing animal toys with teacher, Chinese story telling time &playing with train tracks, . 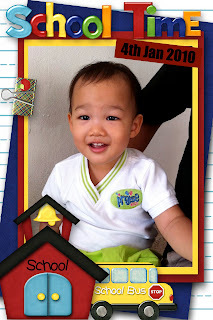 For the past week or so, I have been telling about school, not sure how much he has absorbed though... He was excited about having a school bag & uniform, just like LZ. 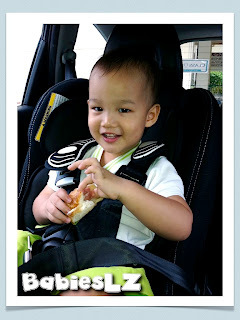 The Bob school bag was Z's which he hardly used it and since he likes Bob, Z gave the bag to his brother. How sweet! Anyway, I doubt he cares if it isn't new, as long as it is Bob! He was very enthusiastic this morning when getting ready for school. He was fine when we arrived at school but was very shy to play at the playground. He slowly warmed up when they were back in the classroom. BUT every few minutes (or less) he will turn around to make sure that I'm there. Think he is going to be like Z, cries the moment I leave. L, on the other hand, happily waved goodbye to me on the first day when they were at this age! One thing I noticed was that he was quietly observing what was the rest doing. For the first few days, they will not be doing any curriculum. Kids will get to know their teachers and the environment. There were only 4 of them in the class for now and more kids will join in after each month. So far so good for the first day of school! 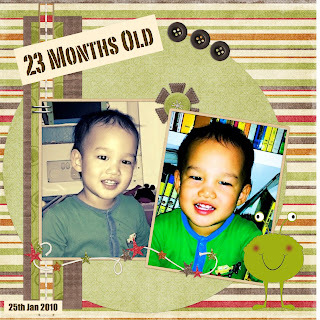 I'm proud of my little boy! He didn't cry at all! 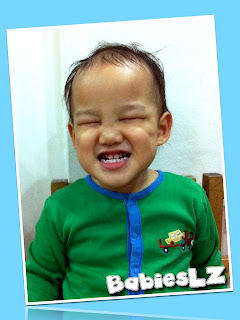 He helped the teacher carried toys, the only child that sit throughout for music time & Chinese story time. The other 3 kids were either crying or clinging to their mummies.. Well done my little boy! Yesterday was the back to school for my LZ. Both of them have new teachers except for their form teacher, remained the same. 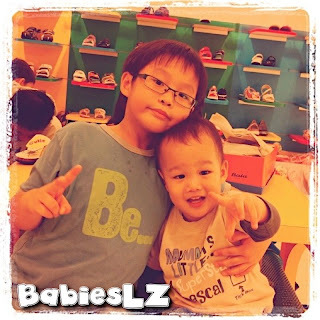 The difference between my LZ is that L looked forward to school reopens and Z hoped school holidays never ends. L promised me she will talk less in class and I really hope so.. Think I'm so used to teachers telling me my gal talked too much. She is showing concerns for PSLE, which will happens only 2 years later and has been asking me which secondary schools are good. I'm happy she knows how important it is but at the same time hope she doesn't stress too much. Very contradicting huh? 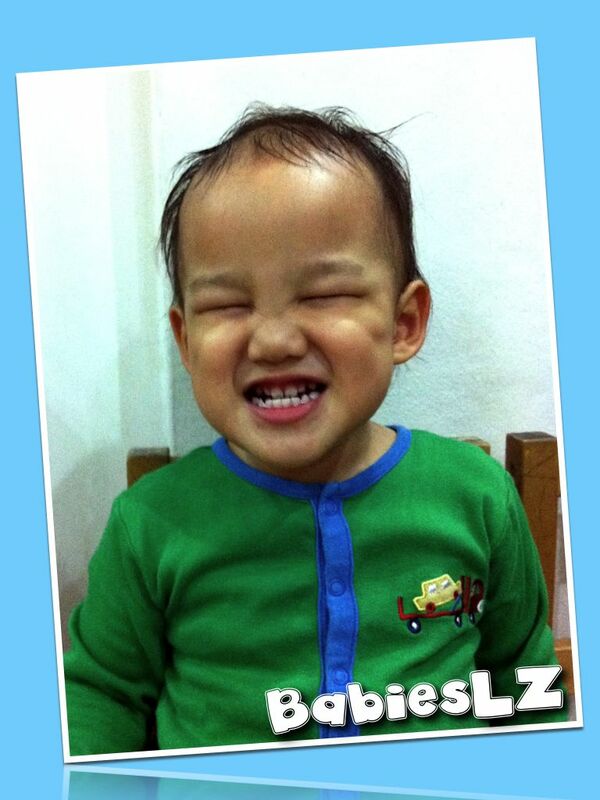 Z was happy to 'announce' that he was selected as assistant monitor for this term & will be monitor for next term. He hoped that the boy that bullied him last year has learnt his lesson and be good. I thought that was very nice of my Z to think of that instead of dislike him. Think I did not mention it at all. Last year, Z was bullied by a boy for a long time and every week he has to upset Z. He either kicked his bag, take his things, shoved him etc... We have complained to teacher but seemed like the boy was not afraid at all. The final straw was when he punched Z on the face. We 'threatened' to make it a police case if nothing is done. Anyway, I'm sure he will enjoys going to school, it's a matter of time and getting used to it. If not, I will be happy to have him at home with me. 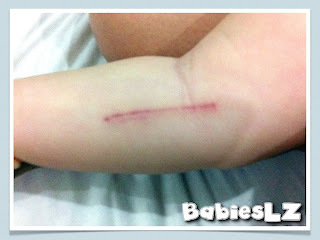 On the first day of 2011, a cut on Beanie's hand while playing.... Thank God it's not a deep one. Phew!